The Silk Road Suite, located on the main floor of the Villa, is noted for its barrel vault ceiling with recessed lighting, and for its hand painted murals depicting romantic scenes from the ancient world, complete with clouds drifting across the blue vaulted sky. 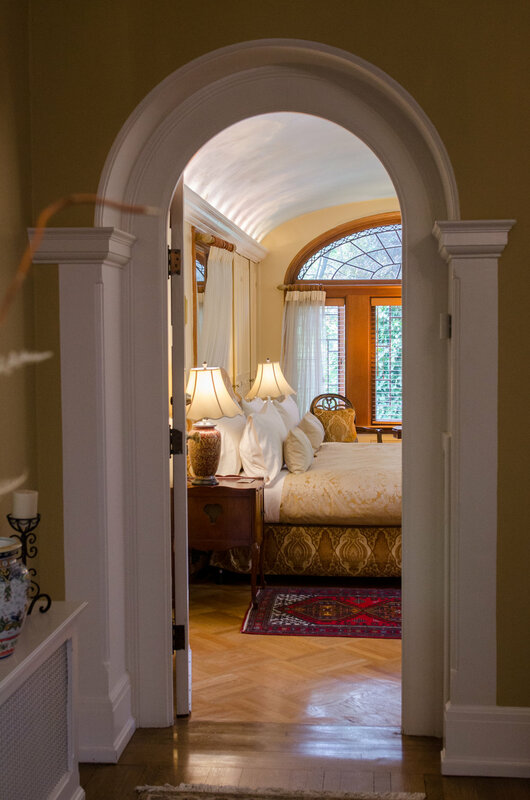 Outside the arched leaded glass windows, sunlight is filtered by an abundance of cherry blossoms in the spring. A wood-burning fireplace with an antique detailed surround is flanked by inset arched windows. Candles placed on the deck of the soaker tub for two further enhances this romantic suite.